All you bargain-hunting fashion lovers out there will probably agree with me that it’s pretty darn difficult to find $2 pants—especially $2 Armani Exchange pants. On a recent shopping trip to Arizona Trading Co., my local thrift store that buys, sells and exchanges vintage and contemporary clothing, I scored just that bargain. 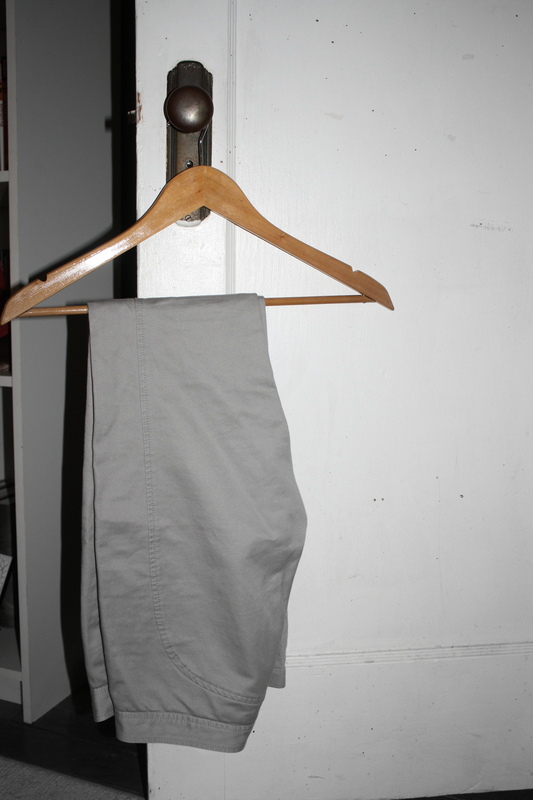 These simple, gray 100 percent cotton pants were buried at the bottom of a sale bin. Really. I had to dig. So far I’ve worn my designer steal to the office, where I’m completing an internship at The Packer, a weekly newspaper for the produce industry. It just occurred to me that the first time I wore them I paired them with a deep purple H&M cowl neck sweater that I also bought at Arizona Trading Co., unfortunately not for $2. While the pants don’t count as dress pants, they are nice enough to wear at my fairly casual office—if worn with an appropriate shirt. They also work great to go straight from the office to dinner or drinks. They’re not so “business-y” that I feel silly wearing them at a bar, but they still look appropriate for work. What do you think of my bargain? Have you scored any deals lately? Tell me about them in the comments section. Check out these throwback ’80s ankle boots found for cheap at an antique mall.